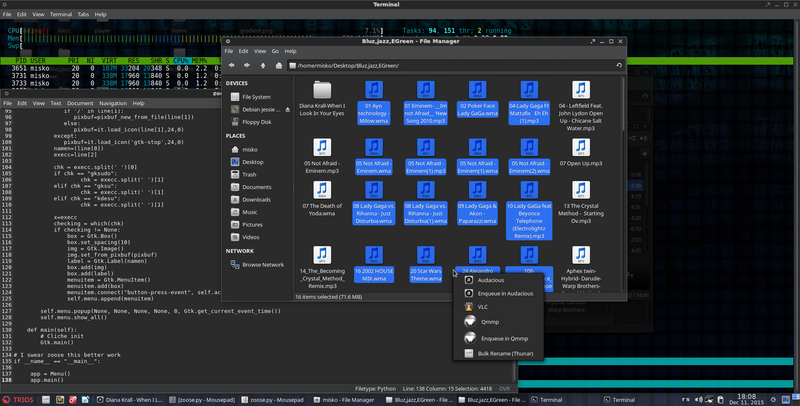 First a BIG THANK YOU to ToZ for his idea on making a Gtk3 menu instead of window to launch a group of thunar custom actions. I guess I was too damn tired when I thought there was no way to close the running script is the user clicks outside of the menu. It was just connected to the wrong signal <blushes>. This is a work around for Thunar's limitation, and as ToZ said there were many requests to group Thunar Custom Actions after the plugin was deprecated. It's a python3 script that launches a group of Actions in a Gtk3 menu from a Thunar custom action. *The script checks if a command/software is installed before adding it to a menu. *If gksu, gksudo or kdesu is used in the command, script will use the next string to check if the command exists. That means it will not work with additional parameters after gksu, gksudo or kdesu. *The icon can be read from a file or an icon set. If no icon is found it will default to gtk-stop icon from an icon set but that can be changed in the script. This is just the script for the Audio Actions and can be changed for any use. Hey Miško, what's the licence on the script? Dang, never mind, it's right there.